I adore this quick and easy sandwich which was inspired by a sandwich I ate in Covington, La., while visiting family there. We went to this darling café and my sandwich had the best cranberry sauce, which I came home and duplicated. That sandwich was just turkey and cranberry sauce, but I wanted to use chicken, so I came up with this. Just chicken was too plain, so I added the ham and it gave this the pop of flavor it needs. The creamy, sweet and tart cranberry sauce is wonderful with the spicy arugula and mellow chicken and salty, smoky ham. You don’t need any fancy bread for this, just plain grocery store wheat works fine. You grill it like a grilled cheese. If you have a child who is able to help in the kitchen, they can assemble the sandwich while you heat the skillet and grill the sandwiches. If you want to make it dairy-free or save calories, simply spray the pan with cooking spray instead of buttering your bread. This delicious sandwich can be turned into a wrap if you’re in a rush and eaten cold. In that case, simply spread the cranberry mayonnaise mixture on the inside of a whole wheat wrap. Top with ham and sliced chicken and a big handful of arugula. Roll up like you would a burrito. And if you do want a lovely artisan bread, then use that and press this like a panini. Yes, it’s versatile and the leftovers are good so you can double the recipe and eat some tomorrow. When warm, add two slices of bread, butter side down, in the pan. Add ham, chicken and arugula and then add the other piece of bread so the butter side is up (just like you would in a grilled cheese). Press down with a spatula and when the bottom side is golden brown, flip it. Cook until the other side is golden brown and serve warm. This entry was posted in 10 minute recipes, Sandwiches and tagged 10 minutes, arugula, chicken, cranberry sauce, easy, ham, lunch, mayonniase, rotisserie chicken, sandwich on February 7, 2015 by Juliana Goodwin. I don’t know what the weather is like where you are, but it’s sunny and gorgeous here. It feels like spring! And that means, I am thinking about spring and getting fit for the season. So a salad is on the agenda today. 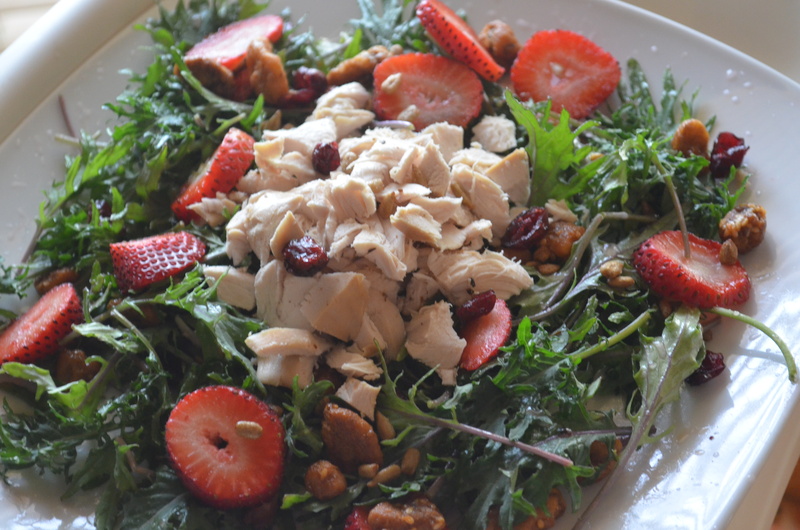 This easy, healthy salad is on the table in about 7 minutes. It’s great for lunch or dinner. This salad is lightly dressed, if you like a good drenching, then double the dressing recipe. Place salad ingredients in a large bowl or plate and then make the dressing. Place salad dressing ingredients in a jar, seal and shake until well combined (you can also just whisk the dressing together if you don’t have an empty jar. But it’s a good idea to save empty jars for this sort of thing). Pour over salad, toss, and let rest 5 minutes. Then serve. 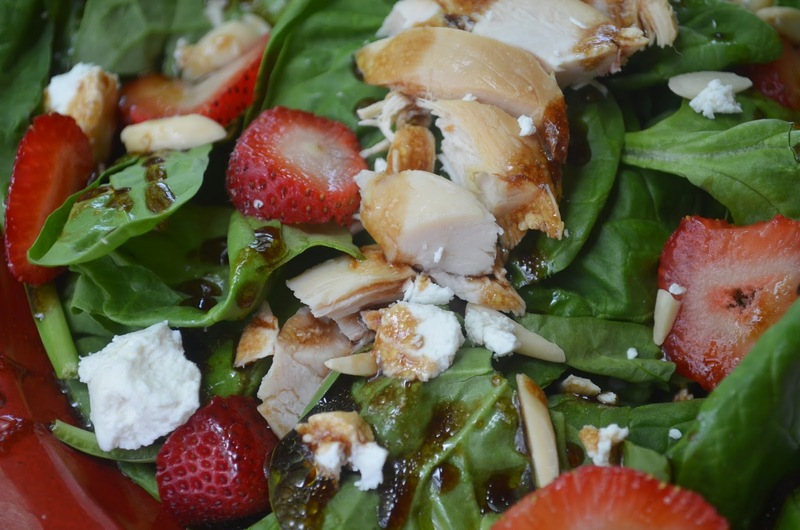 This entry was posted in 10 minute recipes, Salad and tagged almonds, dinner, easy, goat cheese, healthy, lose weight, rotisserie chicken, salad, single serving, spinach, spring, strawberry on February 4, 2015 by Juliana Goodwin.